Choose your frame color for a custom combo that's uniquely you! 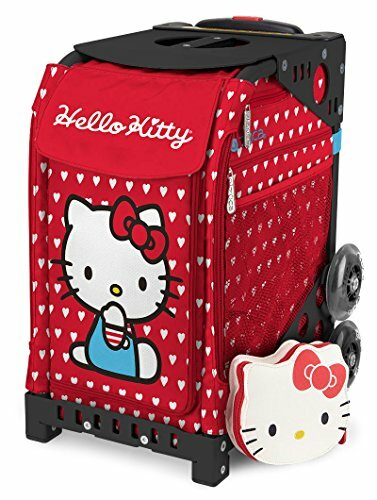 Includes matching mini Hello Kitty pouch, while supplies last. Super-strong, lightweight aluminum alloy frame doubles as a portable seat. Rated to safely support up to 300 lbs. Design-inspired by aerospace technology. Removable, hand washable, Insert Bag is made from premium water resistant 600D polyester. Flashing dual wheel system climbs stairs and curbs with ease. Magneto dynamic 4" polyurethane wheels absorb shock and make for a seriously smooth and silent ride. Non-flashing wheels are available with the Black frame only. 39.5" Telescoping handle, Nylon 6 feet (gentle on floors, chrome-plated & rust resistant screws. Frame Dimensions: 18" height, 12.25" width, 14.75" depth; Weight (frame and bag): 9.4 lbs; Capacity: 1,787 cubic in / 29, 292 cubic cm / 29 Liters.